We’re always looking for ways to do our job better. Recently we’ve been thinking about updating the way we use our social platforms. We regularly post, but altogether we don’t have a true strategy for managing them. Because we know why social media is important, and how it can help us increase our brand awareness we decided that we needed to develop a better strategy so that we can use these channels more wisely. We reached out to different community managers to pick their brain. We received a variety of information and were able to pull a few key things out. We wanted to know what people are doing to get engagement within their communities. So we decided to ask a few questions to help us understand how people are being successful and on which platforms. What social sites are you actively using to interact with your community? Which site do you have the most followers? Which site do you see the most engagement on? We also asked a series of ranking questions in which we wanted to learn what marketers felt was most and least important in using their social platform to achieve different things. We asked 7 ranking 1(least)-10(most). An example of one, ‘How important is your community in retaining customers?’. Through all of our questions, we got some pretty clear answers. Let’s dig deeper into our findings. We asked respondents which platform has A) the most followers and B) the most engagement. It’s no surprise that Facebook tops the list in both followers and engagement. Interestingly, while 32.3% of respondents said that Twitter had the most followers, only 19.4% said that it had the most engagement. We found that Instagram users are by far the most engaged, while Twitter lags in engagement, likely due to the number of bot and dead accounts on the platform. A company’s community of users and customers is a valuable asset beyond the revenue they directly provide. Community is most important to brand awareness and word of mouth referrals, with average rankings of 8.87 and 8.52, respectively. Most respondents agreed, with a low standard deviation in responses, especially in regards to brand awareness. On average, community was ranked least effective at helping to recruit new employees, with an average rank of 5.48. That said, responses had one of the highest standard deviations, meaning companies are likely to find their community either very helpful or not helpful at all when sourcing new talent. Interestingly, there is a moderate positive correlation (+0.46) between those that use Instagram to interact with their community and a recognition of the importance of community for word of mouth referrals. Combined with what we learned above about Instagram’s much higher than average engagement, this makes sense. The takeaway here is that companies that build and manage communities on Instagram are rewarded with deeply engaged brand advocates. In addition, Instagram is moderately negatively correlated (-0.26) with the use of mass email for community management. Encouraging participation by utilizing social media in addition to mass email to reach your community is a great first step. And if you aren’t already, it’s time to start a company Instagram account. Just ensure that you first test and refine your messaging and voice against a younger, and more internet savvy, audience. 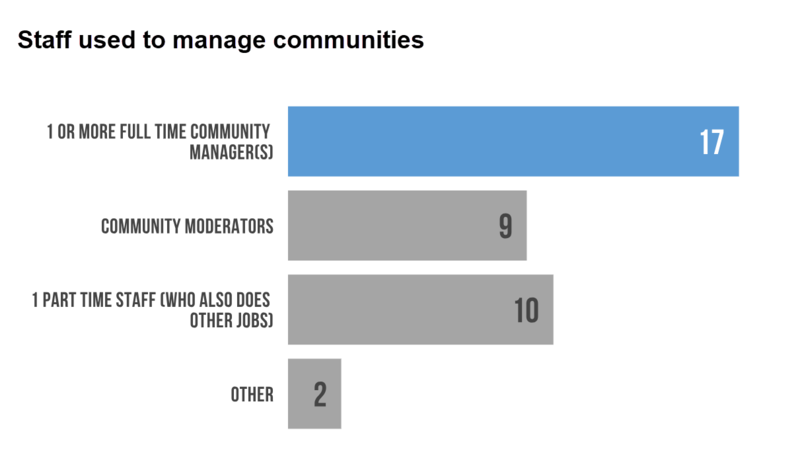 Most brand’s however (17 of the 31), rely on one or more full-time community managers to do the job. Only a few of which rely on other resources like a part-time employee, or community moderators. Note that some respondents were able to choose multiple options. We wanted respondents to give us their juicy details on how they get an online community going. They definitely delivered. We learned quite a few things from how to engage and what to post in order to have a successful community. Our question was simple, and it turned out to be open enough to allow a variety of responses. The question: What’s your best strategy on starting a community from scratch? We’ve organized them by theme, and broke them into 10 sections. Here’s what these community managers had to say. This is imperative to getting your entire strategy right. You can’t come up with content, or even a plan if you aren’t sure who you’re talking to. Levi Olmstead of G2 Crowd explains, “Create a specific niche you want to target and grow your audience from there”. He mentions that they have seen success with this strategy, “We’ve had a lot of success building an audience around social media marketing, and how you can use different platforms, like Snapchat, to grow your authority over the topic”. He goes on to say, “Giving unique perspectives and use cases from our expertise in software platforms, we’ve been able to grow into a significant community with noticeable engagement that’s been valuable to the company”. Andrew Lacomba from MDG Advertising adds in, “When starting an online community, it’s critical to understand your target audience and make sure your brand comes across as an expert”. He adds that “Regardless of your industry, community members want a place where they can connect with other users who share the same passions and interests”. So “by sharing expert knowledge and engaging with users in a relatable voice, you’re encouraging an open space for conversation, learning, and sharing. This strategy ultimately increases brand awareness, attracts potential customers, and nurtures relationships with existing customers”. Juicer.io’s Shawn Pillar makes it seem pretty easy. He says, “Do your research first. Know your target audiences, stick to your brand guidelines across all platforms for consistency, create amazing content, promote your content well, and be as human as possible when interacting with followers and members online”. Monina Wagner from Content Marketing Institute agrees that “ You can’t start building a community until you know who you want to serve”. She says “Before you try to figure out what sites you should be on or how to get people to participate, you need to understand the needs of your target audience”. She brings up a great point saying that, “How can you help them on their journey? Find a core group of people that fit your ideal. Then *ask* them what you can do. Do Skype interviews, nothing more than a handful of questions. Validate their concerns. Applaud their suggestions. Then set your community’s foundation upon that”. Chances are you have a few friends that are interested in what you are. You can use them to further your community. As they probably have good contributions to add. Alexandra Tran from Love Eat Travel explains that her best strategy “is to add your friends and have them recruit others”. She says that “When you start a group, make sure you lay down the ground rules so that everyone understands your brand and purpose of the group. I have a travel group on Facebook that has over 4k members. I have two moderators and we meet monthly to discuss member involvement plans and events”. But don’t feel like you have to add everyone, she explains, “It’s always beneficial to recruit people who are invested in the same topics as you are. My moderators and I all love to travel and this has made them a great additional to Love Eat Travel”. The Brilliant Team’s Nikki Klein adds to that with, “The most important goal in starting a group is that your mission is to add value and give back to the community, with that in mind you begin by adding your sphere and ask them to add their friends”. Nikki explains, “In order to create community, you have to have a dialogue within the group and to make people feel comfortable voicing their opinions you should start conversations and ask questions about local vendors, events”. A pro tip, “Avoid negativity on any level from reviews to experiences. It is really important to have rules established so that there are standards and expectations for your members. Whether you’re running a business page or a fun niche page, offer something of value to followers. By providing such insight you’ll gain followers simply because they want to learn about your topic. Jamie Cheng of Digital Alpha Agency says “The hard part is getting the people to join. You’ll have to give them a reason to join, stay, and engage”. Everywhere Agency’s Danica Kombol adds that “Communities come together around a need, a cause or interest”. Danica explains that “Self-serving communities never work”. She adds, “The same thing is true for communities designed to promote something. When launching a community, start from a zero knowledge base. Don’t assume you know what’s best for your community – ask questions. Get feedback. Experiment. Throw things up on the wall and see what sticks”. Anamaria Scuric from Travelpreneur Tribe agrees that “You need to create valuable content that is adjusted to their problems, so they can start seeing you as a leader”. She also mentions “use attraction marketing and shows people how they can benefit from our products and services”. Her last piece of advice along with understanding your audience and being consistent is “ You must serve your audience daily. The more they see you, the sooner they will build a trust with you”. Anne Patterson of Digital Opportunity Trust gives insight on how to create value. She states “Developing a digital engagement framework/strategy is key – making sure activities are designed across reach, interest, engage, and activate cycles and that you are meaningfully connecting your audience to your assets (and co-creating value) strategically throughout all engagement activities. Providing value to your audience is the most important part of this”. Kris Hughes from ProjectManager.com explains that engaging behaviors should have a pattern. He says “Your engagement behavior should be very similar from one day to the next to cultivate a loyal, and dedicated following who are primed for your message”. He adds that finding your niche is essential “The most important element is identifying a laser-focused niche. All social media – but Facebook in particular – are so saturated with communities and groups from every interest under the sun, if you don’t have this focus it would be far too easy to get lost in the noise”. Lastly, he explains, “Once you have identified your niche(s), it’s important to have guidelines which outline acceptable and desirable behavior from your communities. Once this is laid out, there’s nothing more important than consistency”. SimScale GmbH’s Jousef Murad adds on that “Engagement is the key factor for successful communication”. He says, “It is important to make users spend as much time as possible with the platform and interacting with your site and other community members to deepen the relationship between each other”. And that “Another factor deeply influencing the community activity is gamification in the form of badges, likes, and other features. It allows you to track the most influential users and recruit them for programs to help others”. Museum Hack’s Hayley Milliman says that “The key to starting a cohesive community is to create a place to have needed conversations. At Museum Hack, our job is both to listen to our audience AND to direct conversations. We’re not passive observers, we’re participants – albeit, participants that respect differing perspectives. Hayley says “On our social media platforms, we work to provide content that stimulates discussion”. She says “We want to make people think in new ways – whether that’s by making them laugh through a meme or posing a question that they haven’t thought about before”. She even adds “We teach museums how to facilitate these types of conversations on their own platforms”. Stacy Caprio of Stacy Caprio Inc, says “Leveraging relationships with and opportunities to post in other large, successful communities in your niche”. She goes on to say, “You can do this through outreach to other community owners and trade shoutouts, ask for shoutouts or pay for shoutouts, or you can take the initiative to comment and post in other successful communities”. Her pro tip is, “Start by posting the highest quality content out there that people are hungry for and missing in other communities”. That way you can attract people, “This is a way to organically attract followers and grow your community to be full of people who actually want to be there”. Lesley Lykins from Customer Experience Professionals Association agrees that connecting with the community is key. Saying, “Reach out and personally get to know as many of the community members as you can”. She says “As a community manager, you are the one that will connect community members with one another and the more you know about each individual the more successful you’ll be when seeking to find sources for thought leadership, volunteers and just helping your community members build and strengthen their networks”. Repsly’s Victoria Vessella gives a good tip on how to build your relationships. She says, “In terms of social media, go on a following spree for relevant accounts including customers, publications and journalists, and vendors you do business with”. She adds, “Share insightful content on a consistent basis. Try to incorporate a mix of your own content and content from trusted third parties. Join conversations online that pertain to your business”. Victoria mentions, “Use your community as an outlet to share any major company announcements or to provide a glimpse into its culture”. It’s good to remain loyal to your niche, but you don’t have to blend in. Alycia Yerves of Alycia Yerves Creative, explains, “Niching is good! Don’t be afraid to be different, because this is how you will find your authentic voice, and authentic followers”. Delivering good content and advice is something Jesse Nieminen from Viima says is vital. Jesse mentions, “What we’ve learned is that the most important thing is to just focus on delivering value for others, as simple as it sounds. As long as you’re creating brilliant content that creates value, you’ll build an ever-growing audience”. He says “Once you have that audience, you can engage with them in a myriad of different ways to really boost the community. Here the key is to relinquish some control to the community. It can be scary, but that’s where the true potential of communities lies”! “One of the top things I advise clients to consider when building a community engagement strategy is this: if your business was a real person, how would you want to be perceived in the market”? asks Kelly Jameson Werner of Werner and Media. She mentions, “This is because social media, when used correctly by brands, should come off as an interpersonal conversation”. She further explains, “We like to say that the media used to be a one-way conversation that was institutionally controlled”. But adds, “Now, it’s not just a two-way conversation, it’s a MULTI-way conversation. Brands talk to consumers and media, media talks to consumers, consumers talk to each other”. Stephanie Baiocchi from Impact further explains that using video can be a great way to be personable “Use video to build trust with your community”. She explains “Video, whether live or recorded, creates trust with your community by showing that you’re willing to be vulnerable by being on camera. Plus, members will benefit by being able to put a face and voice to your name”. She finishes by saying “It also reminds all members that they are having conversations with other human beings and not just computers. Including an intro video where you welcome members to your group can also be a great way to set the tone right away”. All of which seems like a nice personal touch. Stuart Ridge from VitaMedica reminds us to do a little research. He says, “Spending time researching the communities of your competitor’s is a great way to figure out how you will differentiate your community”. He adds, “Figure out what you don’t like about their communities or how you think they could be improved, and then act on it. If you are able to make an even better community, chances are people will recognize it”. elMejorTrato.com’s Sophie Miles provides insight on how to do a little research before settling on a strategy. Saying “Active listening is the key to a successful social strategy. By monitoring the activity in networks in real time, we will know what is said about our brand and our keywords”. 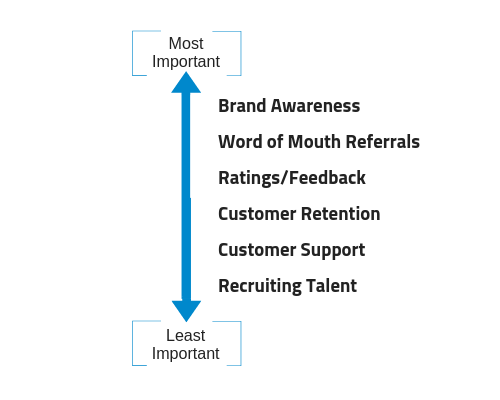 Without doing the research, you might miss your best influencer. She says “You have to be able to identify the influencers of your sector and approach them. The listening process, essential throughout the life of your brand in social networks, is even more important in this initial moment because it lays the foundations of the entire strategy to be followed and defines how we should begin to connect, discuss and interact with the public objective, interpreting the data and acting according to them”. A good way to build a community might just be by inviting people to join it. My Best Wallets, Jacob Seiter says a community is all about “Content creation with lead generation”. He says “Once gained a good number of email subscribers, sending an email inviting everyone to join the community to get things starting”. There are a few tricks he mentions, “Maintaining engagement through the constant publication of relevant content; once the community is open, I would also continue my lead generation campaign, giving away free quality content while inviting people to join my community”. Nicolas Straut of Fundera breaks it down into two steps before notifying customers to join. His steps are as follows “ A) learning the rules of the platform you plan to use and B ) learning what your competitors’ communities are doing well”. He provides the example, “if you plan to create a subreddit, make sure your plans are all above board and don’t break Reddit’s rules for self-promotion and engagement. If you plan to create a Facebook group, covertly join a competitor’s group and see what types of posts yield the most positive interaction”. He ends by saying “When you create the community, make sure to notify your customers and users and learn what they’d like to get from the new community”. Ogletree Financial’s Doug Mitchell chimes in by saying they focus on a specific group before email blasting everyone. He says “Start with your core group of followers and find a few that are as knowledgeable as you are that can also be moderators. We then email blast invitations to our entire group and encourage them to join”. Consistency is another big factor in creating and managing a successful and thriving community. Gabe Perez who social media director at Japan Crate simply states “Take a deep breath, and tackle each medium one by one”. He adds, “You’ll often find that a lot of things such as profile pictures, bio descriptions, initial content posted, etc. transfer over to each platform quite easily”. Gabe also discusses that “It’s easy to get lost in the mindset of ‘have to post across all platforms’ but if you give each social site the time it deserves, you’ll be able to dig beyond the matching profile pictures and discover the true power and potential that each medium can bring to your community”. SocialChimp’s Lauren Petermeyer states “Be consistent”. Lauren says “If you have a new brand with a small following, people will lose interest quickly if you don’t post regularly”. She adds, “Also, identify your goal and main message and stick to it. Everything you do should get you closer to your goal”. Sticking to your brand is key, McCall Robison from Best Company adds in, “Decide on a voice and stick to it”. She brings up a good saying, “Consumers love familiarity and when you have a uniform voice throughout your brand building, people will start to recognize your brand as a familiar face”. That extends to all platforms too, she adds “This also means utilizing online platforms, such as Instagram, Twitter, Facebook, and even LinkedIn”. But don’t slack when it comes to engagement, she says “Give attention to each of these platforms and reach out to your audience on each one. Interact with the community like you’re one of them, not just a brand looking to promote”. By doing so you will create a more authentic image, she says “Find a way to connect and humanize your brand. Take pictures of your teams and give a look behind the scenes. Consumers love to see a face behind a brand; it’s more personal”. It’s pretty clear to see that there are multiple ways to engage and manage an online community. We received a ton of great advice and found that the majority can agree that being consistent and offering value is definitely key. We are going to try out some of these strategies and start by knocking out some of the easier ones first. 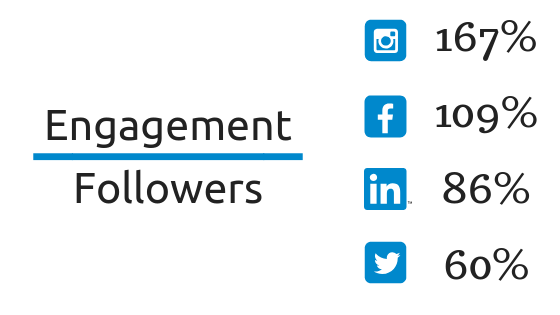 Like by inviting more people to our social media pages (we’d love a follow on Facebook & Twitter) as well as engaging more with followers. We also plan to be more consistent, not just in how often we post, but the material we share as well.